The documentation present in this archive largely relates to the engineering plant. 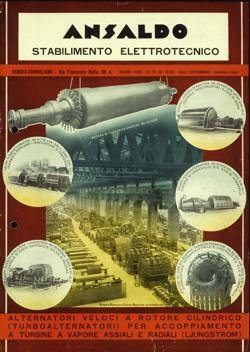 There are notifications, service orders and circulars issued by the plant management between 1890 and 1942; papers relating to HR management and administration from the 1920s through to 1968; statutes and articles of association for different Ansaldo companies, and publications of work contracts, agreements and plant regulations. There are also documents of a political nature from the 1920s through to the 1950s, of particular interest being the Allied and CLN propaganda and fliers from the occupying German forces. The archive was donated by Carlo Gamba, an Ansaldo employee from 1929 to 1973 at the HR office of the Sampierdarena engineering plant. The archive is preserved on microfilm.